UPDATE: South Alabama's Executive Director of Marketing and Communications Mike Haskins has released an official statement. "At approximately 2:15 p.m. on Saturday, July 22, the structure of the Jaguar Training Center, a covered athletics practice facility that is under construction on the University of South Alabama campus, fell within the construction limits of the site. No workers were present in that area at the time. University Police secured the scene of the event, which is under investigation. No determination has been made at this time about the cause." 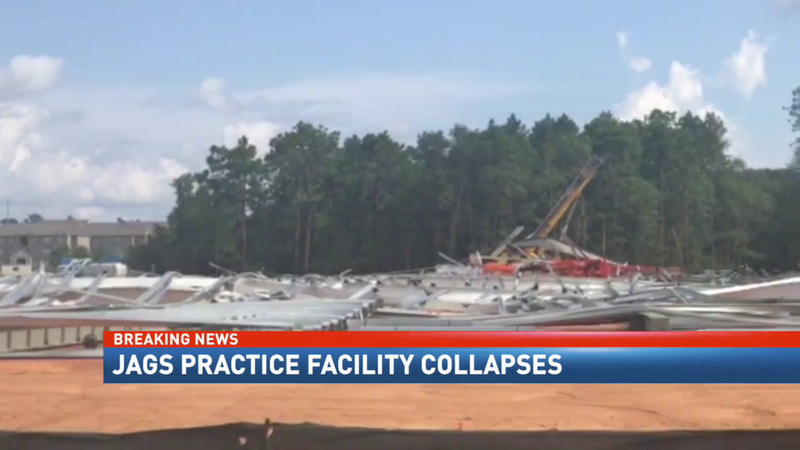 South Alabama's practice facility, the Jaguar Training Facility has collapsed in midst of construction. Local 15 spoke with officials that said the cause of the collapse is unknown at the time. The facility started construction in January and was set to open later this year. Bob Lowry, South Alabama spokesman, said the facility collapsed between 2-3 p.m.
We will update this story when we know more. For more information on the facility, click here.